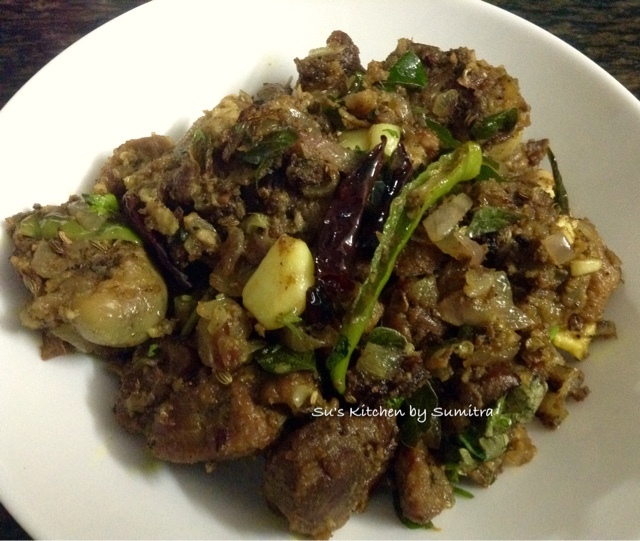 It is a dry spicy Mutton dish. It goes well with dal and rice. There are different ways of making it. I have not used coconut here. I love the smell of the fresh curry leaves which is added to the dish. 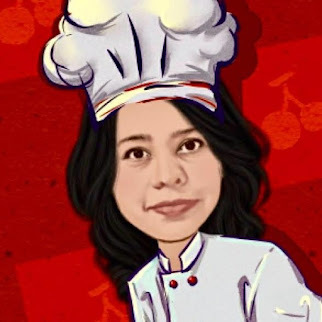 I have made this dish with ingredients as per available in my kitchen. You can do your own variations here. Simple dish and very tasty too. 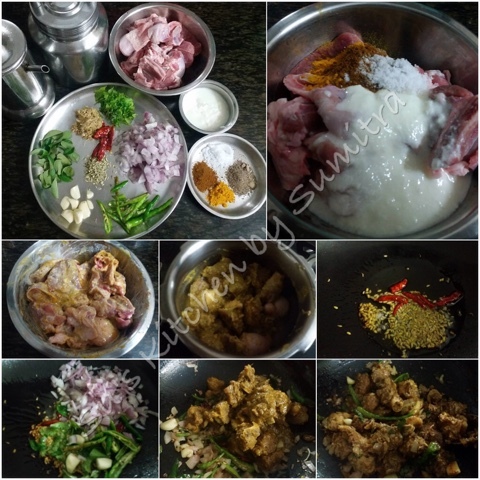 In a mixing bowl add the mutton, curd, turmeric powder, pepper powder, Chettinad masala powder, ginger garlic paste and salt. Mix it and let it marinate for 1 hour. Take a pressure cooker with 2 tbsp oil. Let it heat. Add in the marinated mutton and saute it for 2 minutes. Add 1/4 cup of water and let it cook till 4 to 5 whistles. Once the pressure releases, open the lid. If there is any water remaining, then dry up the water. In a wok heat the ghee. Add the fennel seeds and dry red chillies. Let it crackle. Add the onion, whole garlic, green chilli and curry leaves. Sauté it for 2 to 3 minutes. Add the cooked mutton and stir fry for 2 minutes. Add coriander leaves to garnish. Serve it hot. Dry roast the spices and when cool, grind it into fine powder. Store it in a air tight container, in dry cool place.